Chapter headings. Preface. Part I. The Case for Flexibility. The efficiency of international cooperation in mitigating climate change: analysis of joint implementation, the clean development mechanism and emission trading for the Federal Republic of Germany, the Russian Federation and Indonesia (W. Fichtner et al.). Cooperation in global climate policy: potentialities and limitations (D. Ipsen et al.). The Kyoto protocol and developing countries (M. Babiker et al.). How could emissions trading benefit developing countries (C. Philibert). Costs of a ceiling on Kyoto flexibility (D. Gusbin et al.). Part II. Designing the Flexibility Mechanisms. Organizing emissions trading: the barrier of domestic permit allocation (E. Woerdman). Cooling down hot air: a global CGE analysis of post-Kyoto carbon abatement strategies (C. Böhringer). The liability rules under international GHG emissions trading (Z.X. Zhang). International emissions trading under the Kyoto Protocol: credit trading (J.-T. Boom). Implementing the Kyoto protocol: why JI and CDM show more promise than international emissions trading (E. Woerdman). Project-based greenhouse-gas accounting: guiding principles with a focus on baselines and additionality (L. Gustavsson et al.). Beyond joint implementation - designing flexibility into global climate policy (K.G. Begg et al.). Part III. Beyond Kyoto: Trading Renewable Quotas? Grandfathering and coal plant emissions: the cost of cleaning up the Clean Air Act (F. Ackerman et al.). The development of a green certificate market (P.E. Morthorst). The renewable portfolio standard: design considerations and an implementation survey (T. Berry, M. Jaccard). Renewables portfolio standard: a means for trade with electricity from renewable energy sources? (S. Espey). Interactions of a tradable green certificate market with a tradable permits market (P.E. Morthorst). Author index. 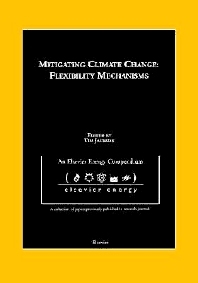 This compendium contains a collection of key papers from the journal Energy Policy, offering a valuable reference point on the role of flexibility mechanisms in the mitigation of climate change. Originally published between December 1999 and August 2001, all of these articles concern particular aspects of the Kyoto mechanisms or variations on the theme of flexibility that have evolved elsewhere. For better or for worse, flexibility mechanisms have become a part of the institutional architecture of energy policy in the 21st Century. As the contributions to this compendium illustrate, this fact has both positive and negative connotations. Flexibility mechanisms have the potential to unleash exciting market-led emission reduction initiatives, and to promote both technological and institutional innovation. At the same time, the complexity of establishing credible and robust arrangements, in which practicality and viability are balanced with appropriate safeguards against loopholes and gaming, should not be underestimated. In the longer term, the flexibility mechanisms may turn out to be unhealthy distractions from the much more important task of restructuring domestic energy systems. Or they might just turn out to be indispensable instruments for achieving the deep cuts in emissions that climate change demands. One thing, however, is abundantly clear: climate policy has guaranteed that energy policy will never be the same again. For energy economists, consultants, corporate planners, energy researchers in universities, banks, energy industries and government.